Crashlands [GOG, Steam, Official Site] is a silly story-driven crafting ARPG and as of today it's officially available for Linux gamers. Craft, battle, and quest your way through Crashlands, a story-driven Crafting ARPG overflowing with sass! Linux support took a little longer than expected and the Beta period did take a bit of a break for a while, due to issues with the game engine (GameMaker Studio 2). Suddenly a new Beta appeared out of the blue and then not long after we have the official release! Really glad they were able to put in some extra time to bring the game to Linux. 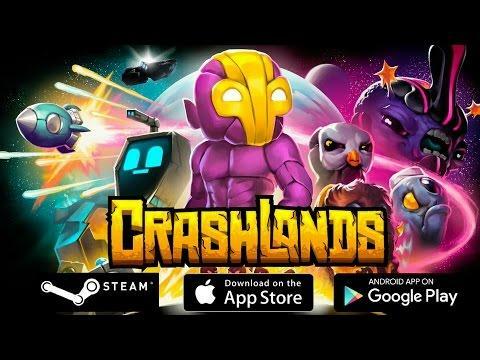 What makes Crashlands interesting, is that it has cross-platform saved games that work between PC and mobile platforms. Could be a good one to pick if you often switch between Linux and an Android device. It uses cloud saves, so you can pick up where you left off each time. The one main issue with the game is the grind, which does increase as you progress further into the game. The developers are aware of this, but they haven't yet come up with a solution to reduce the feel of it. You will see many mentions of it in reviews and I also saw it a fair bit during testing. Grind is a interesting word though, as it means different things to people. I wouldn't let it instantly put you off, it didn't put me off that's for sure. What we have here is a very interesting crafting/RPG with some good humour and plenty of content to keep you going. You can find it on GOG and Steam. Note: GOG links are affiliate links, it helps us! If you ask, I already have libcurl-compat and libcurl-gnutls installed, as dependencies of steam-native package. I also have the 32-bit versions of libcurl. P.S. totally untested but it shouldn't harm anything - it just forces the libcurl.so.3 library to get precedence when starting the process. Should you maybe preload the older libcurl? Try adding "LD_PRELOAD=libcurl.so.3 %command%" to the launch options in Steam. Then you LD_PRELOAD=libcurl-compat.so.4.5.0 or whatever it happens to be. EDIT: Ofcourse first check if manjaro has the compatibility lib in it's own repos. ziabice If you ask, I already have libcurl-compat and libcurl-gnutls installed, as dependencies of steam-native package. I also have the 32-bit versions of libcurl. But do try libcurl-compat.so.4.5.0. I guess it can't hurt. Another option would be to try using the full steam runtime instead of steam-native. And it worked! Hope this helps! An easier option would be to set env "LD_PRELOAD=libcurl-compat.so.4.5.0" %command% as the launch option. This should be fixed soon and I think it only affects non ubuntu users? yeah, but I have my savegame on mobile... so what now? oh cloud save... sounds interesting.